Manhattan is the most densely populated place in all of America, with some of the best food, shopping, and attractions in the world—and in that's not even taking into account the outer boroughs! If you're new to the city you might find getting around a little confusing at first, but don't worry the public transit system is set up to make this crowded city life as easy and efficient as possible. Once you familiarize yourself with the transit you'll be hoping on and off like a native in no time. There are several methods you can use to navigate around New York City, besides walking of course, which most New Yorkers will tell you they do pretty frequently. First things first, New York has a few different transportation systems: The subway, bus, and ferry all work to move people in an out of the city quickly. Which method you take depends largely on where you want to go, and like most major cities there's more than one method to get you there. Since the New York transit systems are integrated, you can transfer between the different systems pretty easily. The New York subway system is huge and can make your trip much more enjoyable if you know how to use it. One defining feature of the New York Subway is that it runs 24/7 all year long, fueling the idea that New York is the city that doesn't sleep. 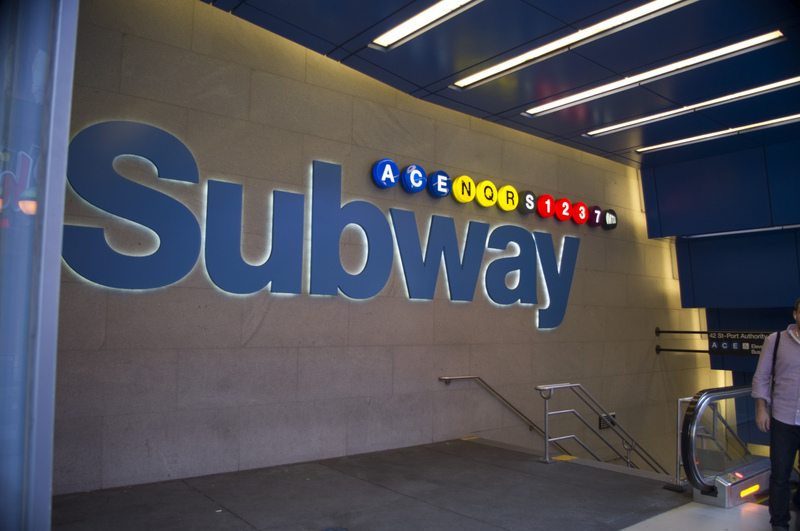 It's also worth noting that the term 'subway' which usually means below ground, is used despite the fact that around 40% of the system is actually elevated above ground—so don't be surprised when the sun shines in through those windows. Whether you buy a Singleride ticket or a Metrocard pass you will need to purchase them inside the station. The Singleride tickets are ONLY available from the vending machines. The Metrocards can be purchased from a machine or from the person in the booth. Determining which type of ticket or pass you should buy largely depends on knowing how much you will travel in the time you are there. Unlimited MetroCard passes can be great if you know how much you plan on traveling but if you don't travel the minimum number of time you could end up paying more than purchasing Singleride tickets. Singleride: The cost of a Singleride New York subway or bus ticket will cost you $2.75 USD, and can be purchased at the machines inside each station. The Singleride ticket is not meant for transfers, and it must be used within 2 hours of purchase. This would be the route to go if you plan on riding the subway or bus just once while visiting New York. MetroCard: If you plan on traveling more than once during your time in New York getting the MetroCard instead of the Singleride ticket will bring don the cost of each ride to $2.50USD. The MetroCard will cost you $1.00USD to purchase, and you have to put a minimum of 2 rides on the card at your time of purchase, bringing the card to a total of $6.00USD. The MetroCard can be refilled with rides at any of the machines inside the stations when you run out. The reason there is a $1.00 fee to purchase the Metrocard in the beginning is to encourage users to use reuse the cards they have instead of throwing them away, in an effort to bring down city transit costs and be environmentally friendly. This is a good option if you know you'll ride the transit more than twice but are unsure how many other times you'll use the system. Unlimited MetroCard Pass: This type of pass is used in increments of 7-days ($30.00USD) or 30-days ($112.00USD) and will give you unlimited access to the transit over that period of time. If you'll be in the city for a week and you plan on taking the subway twice a day, the 7-day pass will pay for itself and any the other rides in-between will be a bonus. If you plan on taking the subway say 6 times a day for week, a 7-day pass will mean each of your rides will be drastically reduced in price over the span of the week. This is a good choice if you know you will be utilizing the transit a lot during a longer stay. There are over 400 stations in New York and one near pretty much every major site, making it easy to explore every inch of the city using transit, but a bit confusing if you don't know the line or station you need to be at. When you're on street level you can spot a subway station entrance by the green lamps, metal railings, and underground staircase that lead to the mezzanine area below ground. The lamps outside the entrance will be green or red, green means you can enter while red means the station is either closed for construction or being used as an exit only. When you approach the stairs you'll see a sign displaying colored circles indicating which subway line you can reach from this entrance. When you enter you'll be inside a mezzanine area that will allow you to cross to the other side of the street/platform without fighting the traffic at street level above. Each transit line has a number or letter associated with it, and the color mention previously, this is used throughout the system to indicate which line you are on and to make it easy to transfer lines. You can get a map from the person working inside the subway booth, which will show you all the lines and where you make transfers. When you're inside the station you'll see both a map of the subway line, as well as a map of the neighborhood with street names posted on the walls. These neighborhood maps can be really helpful if you are a tourist trying to find something specific and you don't know the neighborhood very well. You could of course, load up your normal Google Map on your phone. We previously mentioned strategies for dealing with data charges abroad, in our Guide to Essential Travel Technology. As with the subway system, learning to use the bus system in New York can save you time. The bus system goes in places the subway doesn't, so you might need to take a bus if you are traveling outside the city core. Tickets for the New York bus system are the same as the subway tickets described above. INSIDER TIP: Learn to use the free metro transfer and you can get two rides for the price of one! This is how the free transfer works: Swiping a metro card allows you to 2 hour window to transfer between subway lines if you are going in the same direction. However, if you swipe your metro card for example going uptown, and then take the bus back downtown you can use that same transfer as long as it is in the two can use your card will register the trip as a transfer if it is in the 2 hour window. Manhattan is an island and with water on all sides the ferry system has to work hard to bring in and out people from the surrounding areas. If you want to visit some of the sights outside the city core you'll want to take advantage of the ferry to get you where you need to go. The Staten Island Ferry runs from Manhattan's Whitehall Ferry Terminal to St. George Terminal on Staten Island. This is, in our opinion, one of the very best ways to see the Statue of Liberty. You can hop on the ferry during the middle of the day (NOT during rush hour!) and relax into a seat and take in the view. The ride is about 25 minutes each way and bonus! it's totally free! This is a commuter ferry that runs between a few stations in Manhattan, New Jersey, and several of the outer boroughs of the city. New York has several public bicycle options where tourists can rent some wheels to explore the city like a local. Be warned, riding a bike in New York can be a little tricky if you aren't use to a lot of city traffic. A bike rental can also be handy if you want to explore the parks and get a little exercise while you're at it. If you're main objective is to shop and do sightseeing, a bike can sometimes get in the way and become a hassle locking it up and carrying around a helmet. Citi Bike is a public system that allows users to purchase a membership of 1-day ($9.95 USD), 1-week ($25.00 USD) or 1-year ($95.00 USD). You can dock your bike at several locations around the city and if you have a daily or weekly membership you get 30 minutes of free riding time, after that it is $2.50 per 30 minute segments with a cap of $12.00 USD per day. The idea with Citi Bike is to have people use the bikes for short trips, and so it is most useful if that is how you use it. There are a few other privately owned shops in New York that will rent to tourists for a daily or hourly fee, but many of them get fairly nasty reviews. If renting a bike in New York is something you really must do, it's important that you do a little research first. And as we all learned from miss Bradshaw walking in New York—even in heels— will get you everywhere you need to go and keep you looking great to boot.